Datacard® Adaptive Issuance™ Suite is a complete family of products for secure document issuance. 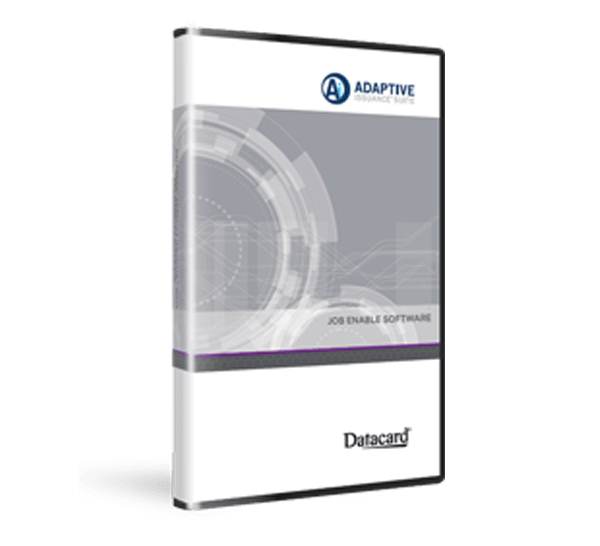 Datacard® Adaptive Issuance™ Job Enable provides an interface to automate daily tasks, efficiently reduce operator intervention and streamline operations in your issuance environment. The platform is highly secure by controlling production job start and offers the ability to monitor Central Issuance systems and job status, and retrieve production statistics in real-time. Global support contact information for all products and services organized by country. Find downloadable resources you need, including drivers, utilities and patches for your Entrust Datacard product. View videos related to your Entrust Datacard product, including educational and how-to videos. Want to learn more about your Entrust Datacard product? Here you’ll find brochures, data sheets, white papers and more that provide you the information you need. Let's discuss what Entrust Datacard solutions can do for you. A minimum of 2 GB free hard drive space is required for the installation of the program, initial database files and running the program. Any additional hard drive capacity requirements need to be assessed based on how the software is used. The system configuration may need to be adjusted depending upon the number of personalization system equipment and the smart card application profile.